Weed management in nursery crops can be one of the most costly components of crop production. Producers of container nursery crops rely primarily on two methods of weed control—multiple applications of preemergence herbicides and hand-weeding. Regardless of which herbicide is applied, the product must be applied accurately and uniformly to achieve effective weed control and to avoid over-application, which may injure crops. 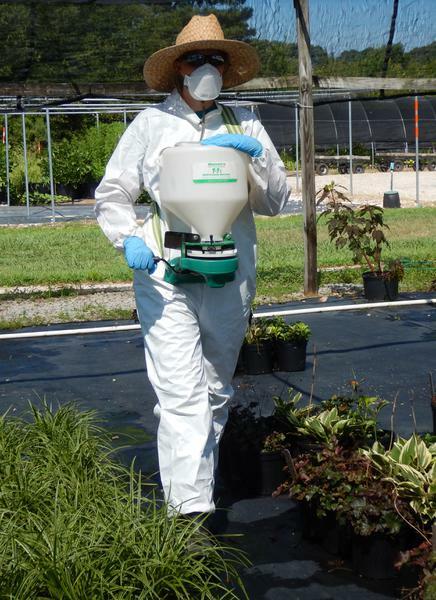 Most preemergence herbicides used in container nurseries are formulated on granular carriers. The standard application method is with a hand-held, hand-cranked “belly-grinder” type of rotary spreader. Two of the more commonly used models are the Warren T7-II and the Solo 421S, but other models are available. The uniformity of spread using these devices has been shown to be quite variable (Figure 1). We have measured granular herbicide applications at nurseries and found up to 250% variability from one pot to another within a container block. Increasing the uniformity of herbicide distribution will improve weed control and decrease the potential for crop damage (Figure 2). When using these granular spreaders, the most important factors affecting the distribution pattern and dose include: walking and cranking speed, swath width, rudder setting, amount of granule in the hopper, spreader output setting, wind speed, and walking patterns. Figure 1. Example of variable granule distribution. Figure 2. Uniform herbicide distribution will result in better weed control. Granular spreaders typically have a distribution pattern in which the largest amount of granules is deposited directly in front of the applicator, with lesser amounts falling to the sides (Figure 3a). To apply a uniform amount over an area, some overlap between passes is required. Overlapping each side of the distribution pattern by 30 to 35% for a total of 60 to 70% overlap creates the most even application (Figure 3b). How close together the passes are, and as a result how much the passes overlap, is called the effective swath width. Figure 3a. A typical pattern of granular distribution from a “belly-grinder” spreader. Figure 3b. 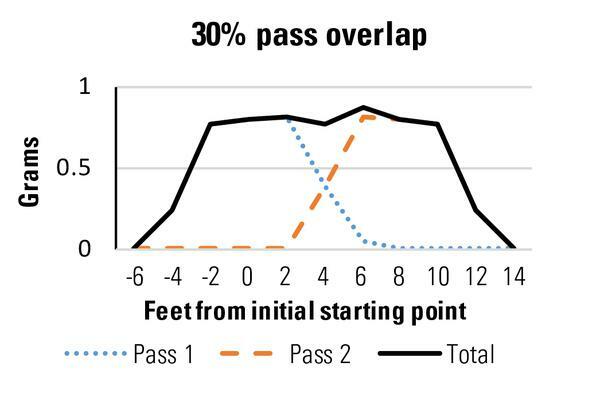 Overlapping passes by 30 to 35% will result in more uniform granular distribution. The amount of granules applied to a given area is influenced by the applicator’s walking speed. The faster you walk, the fewer the granules put out (Figure 4). 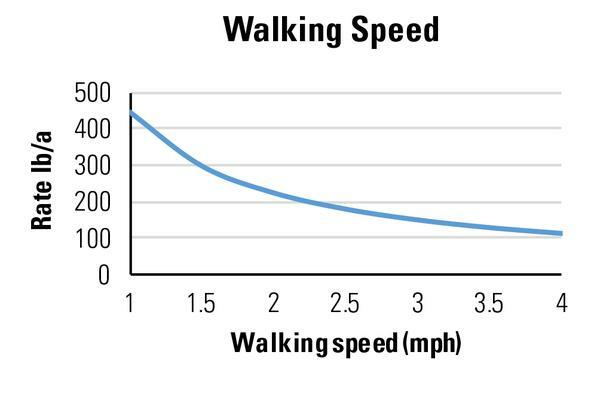 A comfortable speed for most people is 3 mph, or 100 feet in 23 seconds. How fast you turn the spreader crank also influences the distribution of granules (Figure 5). When calibrating your spreader, make sure to use a speed that is comfortable. Then be consistent. You may use a metronome (Figure 6) to maintain constant walking and handle-cranking speeds. 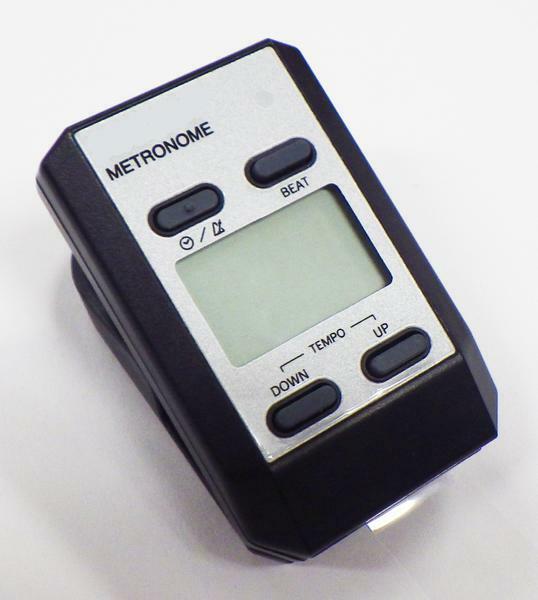 When using a metronome, try 99 to 103 beats for the walking speed and 60 for the handle-cranking speed. Figure 4. The faster you walk, the lower the application rate. Maintaining the speed you used while calibrating the spreader is important in maintaining a uniform application rate. Figure 5. Comparison of two handle-cranking speeds. The faster speed resulted in a wider spread and lower rate. Maintaining the handle-cranking speed used when calibrating the spreader helps keep the application rate and swath width consistent. (rpms). Figure 6. A portable metronome like this can help you maintain a consistent walking pace and cranking speed. 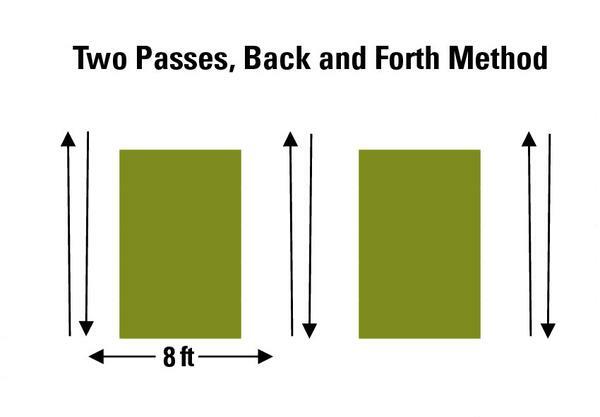 The distance between passes with a granular spreader (the swath width) has a large impact on application uniformity. For instance, with a 12-foot swath width, the average distribution pattern of FreeHand granules using a Warren T7-II spreader is very uneven (Figure 7). The gaps can be greatly reduced by using an 8-foot swath width instead (Figure 8). A swath width of about 8 to 10 feet works best for the average granule carrier. Figure 7. This spreader pattern reflects a 12-foot swath width; right, center, and left rudder positions; and the typical back and forth spreading pattern. Figure 8. 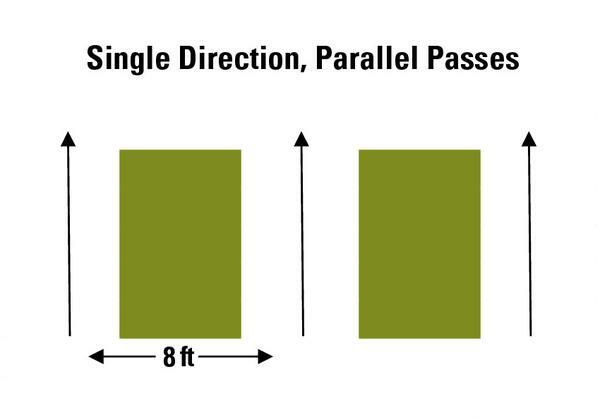 Having a narrower swath width improves application uniformity. This spreader pattern reflects an 8-foot swath width; right, center, and left rudder positions; and the typical back and forth spreading pattern. Some spreaders can be adjusted to throw granules more to the right or the left, reducing the amount of product applied outside the container beds (Figure 9). However, using these rudder positions creates spikes in the amount of product applied to the outer edge of the application area (Figure 7, Figure 8, and Figure 10). This can be avoided by using only the center rudder position on spreaders with multiple rudder options (Figure 11). Holding the spreader at an angle while using the center rudder position also creates spikes in application and is not recommended. Figure 9. Adjustable rudder positions on a Warren T-7 II spreader. Figure 10. 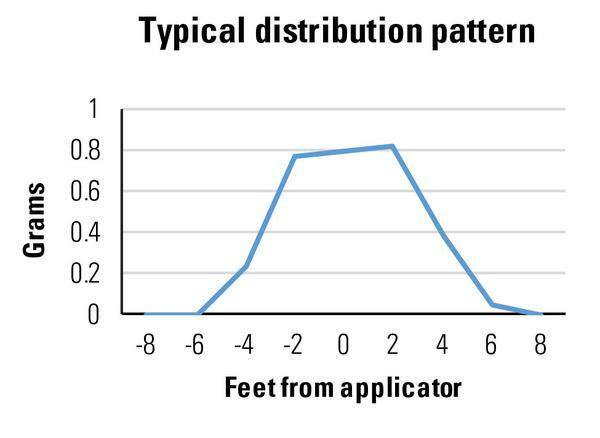 This typical granular distribution pattern was created from a Warren spreader by using the far left, center, and far right rudder positions. Using the left and right rudder positions created peaks in the amount of granules applied. Figure 11. Using only the center rudder position improved spreader uniformity. This spreader pattern reflects an 8-foot swath width, center rudder position only, and the typical back and forth spreading pattern. The amount of product in the hopper at any given time affects the rate of application. Application rates can be as much as 45% lower when the hopper is only 10% full than when the hopper is completely full. Don’t wait until the spreader is empty to refill. Add more granules when the level in the hopper drops to about 25% full (Figure 12). Figure 12. Keep the spreader at least 25% full, as shown by the arrow. Start walking and cranking the handle before opening the hopper. Otherwise, the spreader tends to drop a large amount of granules at the beginning (Figure 13). Waiting to open the hopper also helps prevent the spreader from jamming and dropping granules in one spot. Figure 13. This pot received a HUGE dose of herbicide when the applicator opened the hopper before cranking the handle. If there are greater than 5 mph winds, do not use the granular spreader. Wind interferes with the uniformity of application. In Figure 14, notice how wind blew granules to the edge of the pot. This will inhibit root growth where the excessive herbicide is deposited and provide poor weed control where little or no herbicide is present. Figure 14. Wind blew granules to pot edge. Applicators commonly walk a back-and-forth pattern (up one side and back the other) (Figure 15). 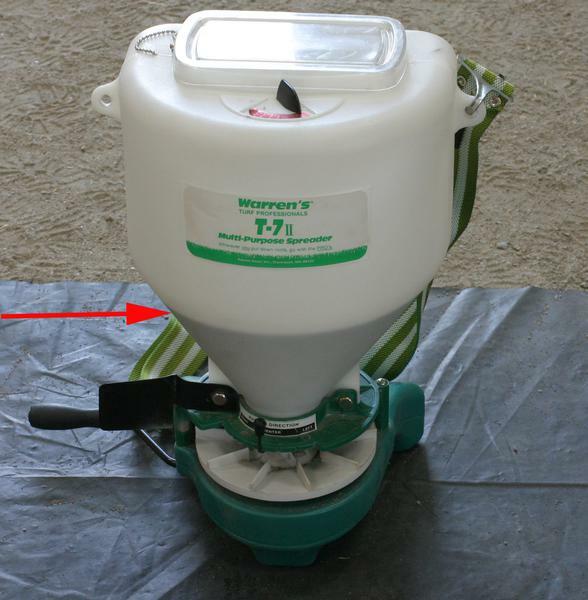 This pattern provides an acceptable, balanced distribution (Figure 16a) only when the spreader is fully open (setting 6 on the Warren T7-II or Solo 421S spreaders), and only with a few herbicide granules (notably the clay granule used to make FreeHand G and Pendulum 2G). The fully opened setting may be appropriate for some herbicide applications, but lower settings are often required to achieve the desired application dose. When the lower settings are used, the distribution pattern is skewed more to the right (Figure 16b). This will dramatically affect the uniformity of application (see Figure 17a). There are two ways to compensate for this skewed pattern—change the direction of travel, making all applications while walking in the same direction (Figure 18a), or make two passes over the same path in opposite directions (Figure 18b). If you have calibrated your spreader to apply the full dose in one pass, then applicators must walk in the same direction (Figure 18a). This might be most easily accomplished by having multiple applicators working together. Alternatively (and preferably), calibrate your spreader to apply half the target dose and walk the area twice in opposite directions (Figure 18b). Remember—if you make two passes over the same path, you must calibrate your spreader to apply only half of the labeled dose each time. Figure 15. Typical back and forth application method. Figure 16a. Sample granular distribution patterns at two spreader output settings. When the spreader is at the highest setting, the pattern is relatively uniform. The vertical lines mark the “center” position (where the applicator is walking). Figure 16b. At lower settings, the spreader distribution is skewed to the right. Instead of being centered, the peak dose is 2 to 3 feet to the right of the applicator. The vertical lines mark the “center” position (where the applicator is walking). Figure 17a. Sample granular distribution with a Solo spreader at Setting 4 with an 8-foot swath width, center rudder position, and a middle output setting. Distribution pattern created when making parallel passes in two directions (back and forth). Figure 18a. The single direction, parallel pass method involves walking up and down between each bed, but only spreading in one direction. The arrows represent walking while spreading granules. Figure 18b. The other option is to make two passes by walking up and down between each bed, spreading in both directions at half the labeled rate. The arrows represent walking while spreading granules. It is also important to know how much product your spreader is putting out. Great uniformity will still produce poor results if you’re putting out too much or too little product. Test your application rate and adjust your walking speed and spreader setting as needed. More details on calibration can be found in Calibrating Hand-Held Granular Spreaders for Nursery Weed Control. Maintain a consistent walking speed. Use a metronome. Maintain consistent cranking speeds. Use a metronome. The size of the beds matters! 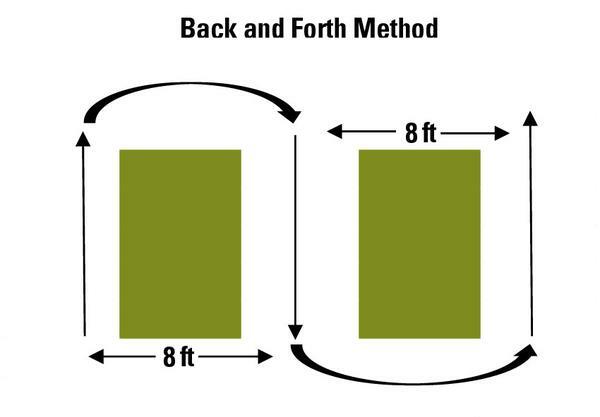 Keep nursery beds between 6 and 8 feet wide (for an 8- to 10-foot swath width). Only use the center rudder position. Do not hold the spreader at an angle. Refill the hopper when the level drops to about 25% full. Don’t wait until it runs out. If the wind is 5 mph or more, don’t make the application. Wait for a calmer day. When using lower spreader settings, spread granules using the single direction, parallel pass method. This publication was made possible by funding from the Southern IPM Enhancement Grant Program.